Salesmsg is scalable business texting software that allows users to send, receive and manage text messages conversations online. The platform enables two-way conversations between businesses and their leads, prospects, and other contacts. With Salesmsg, businesses can pick their own local number and send and receive messages from any device through the web app and native mobile apps for iOS and Android. Each team member can be given their own unique phone number to manage messages. With canned responses and templates, users can save time and automate the sales process with one-click responses to recurring questions. The merge field option enables the personalization of messages with custom data from connected CRM or marketing automation systems. Built-in call forwarding allows users to forward incoming calls made to the business number to their mobile, landline or office line at any time. Salesmsg lets users capture names, email addresses, and other useful data from text messages and add it to their CRM system. Conversations can be archived to keep the inbox tidy, and pulled up at any time through search. Support for MMS messaging enables the exchange of pictures, GIFs and vCards. 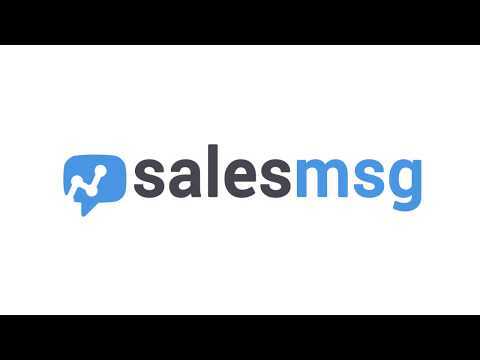 Salesmsg also allows users to book appointments from within the chat and add them to Google, Office 365 or their CRM’s calendar application with just one click. Opt-out and unsubscribe management tools makes it easy for contacts to opt-out from receiving messages. Getting responses from customers immediately is fantastic.We use this software to contact all of our clients and it works well. We are working on integrating it more fully with our current software. We use this software to contact all of our clients and it works well. We are working on integrating it more fully with our current software. It does not fully integrate with Outlook. Also, I would like SalesMessage to use our current business number to send messages. This feature does not work for us currently. Thanks for the great feedback Sabrina! We do allow you to use your existing landline phone number with Salesmsg. We'll reach out and share with you how to set that up. It was really easy to setup and the customer support has always answered my questions quickly. I ask a LOT of questions of support teams and they have done a great job at helping even when they couldn't directly solve my problems. We've seen a big improvement in our appointment attend rate from connecting Salesmsg to Zapier to automate SMS reminders and start an instant conversation. Just being able to simply text back and forth has really helped our sales process. We've seen a big improvement in our appointment attend rate from connecting Salesmsg to Zapier to automate SMS reminders and start an instant conversation. Just being able to simply text back and forth has really helped our sales process. The mobile app is difficult to use. It struggles to load messages so we find ourselves using the desktop app 99% of the time. GREAT software with endless opportunities and amazing customer service to go along with it! Better communication with leads and increased conversions!The interface is VERY easy to use, but that isn't even the best part. The BEST is the workflow and webhook integration that allows us to automate messages from our CRM so that we can engage with our contact leads almost IMMEDIATELY! We have seen an amazing response from our leads and can contribute multiple sales to the use of this software. HIGHLY recommend if you want to increase conversions by opening up another method of communication with your leads. The interface is VERY easy to use, but that isn't even the best part. The BEST is the workflow and webhook integration that allows us to automate messages from our CRM so that we can engage with our contact leads almost IMMEDIATELY! We have seen an amazing response from our leads and can contribute multiple sales to the use of this software. HIGHLY recommend if you want to increase conversions by opening up another method of communication with your leads. As an early beta user, there were some bugs and issues at first, but Salesmsg communicated well and their support team was VERY quick to rollout updates and fixes. Still waiting for a couple more features but confident they will arrive soon! Thanks David! Excited to see it scale for you guys! I've worked with Salesmsg (Sales Message) for awhile and am part of the team building out the product, so I want to make that clear before you read my review. I've found that the two way text messaging platform is easy to use and would recommend this to any business looking more than a sales text messaging service. This platform is great for sales, marketing, customer support and internal team use. It really has applications for almost any business need where you're trying to reach customers. Text messaging gets such a higher response rate than any other channel (much higher than email) it would be a great option for any small to enterprise level business looking to dive into a text message based solution to reach their customers.Great product and innovative team, the ease of use and expanding functionality of the product. Great product and innovative team, the ease of use and expanding functionality of the product. Can't find anything that I didn't like, the platform is easy to use and the interface is easy to understand. What I love most is how Salesmessage integrates and syncs with Infusionsoft and stores our messages in their contract record! Its a little slow when moving from one person to the next and going thru many replies. Pro: $30/month; $10/month per additional seat. Enterprise: contact Salesmsg for pricing. Messages can be scheduled to be sent to contacts at specific times and dates, and automated replies can be created and triggered when contacts try to reach users outside of office hours. The web app and native mobile apps for Android and iOS allow users to send, receive, and manage their messages from any device. Built-in call forwarding allows users to forward incoming calls from message contacts to their office line, landline, or mobile. Each member of the team can have a unique number that allows them to send and receive messages. CRM systems can be connected to Salesmsg to sync contact data, enabling the personalization of messages, and to automatically record contact activity and notes from recent conversations. Below are some frequently asked questions for Salesmsg. Q. What type of pricing plans does Salesmsg offer? Q. Who are the typical users of Salesmsg? Q. What languages does Salesmsg support? Q. Does Salesmsg support mobile devices? Q. Does Salesmsg offer an API? Yes, Salesmsg has an API available for use. Q. What other apps does Salesmsg integrate with? Q. What level of support does Salesmsg offer?